Updating an item from yesterday, it looks like Neil Young’s management has wisely reversed course and decided not to undermine the anti-consumerist stance of Neil’s new record, Living With War, by selling thousands of overpriced Living With War T-shirts. 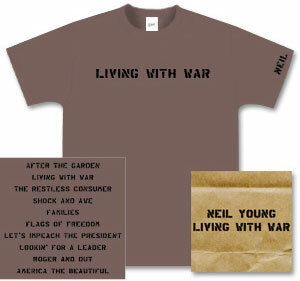 In my e-mail box this morning, this message: “Dear Neil Young Fans — We wanted to let you know that the Living with War T-shirt has been removed from the store at NeilYoung.com. The T-shirt was approved by management without Neil’s approval, and at his request it has been removed and will no longer be offered. Existing orders will be honored. We appreciate your understanding. Sincerely, NeilYoung.com.” Now, of course, I regret not ordering one.